God showed up and took us on a journey that required obedience and submission to him. The ultimate test of trust. 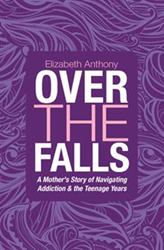 After her daughter struggled with addiction as a teenager, Elizabeth Anthony penned “Over the Falls: A Mother's Story of Navigating Addiction & the Teenage Years” (published by WestBow Press) to share her daughter’s story and tell how faith helped their family have hope. The book chronicles Anthony’s daughter Kaci’s struggle with drugs. Anthony includes particulars about how she, her husband and their son Brody were all affected by the choices Kaci made. Rather than ending with the family rent asunder, the story shows how the family’s faith in God proved to be a source of strength and, ultimately, healing. Elizabeth Anthony was born and raised in Alberta. Anthony’s passion is to mentor young people to help them reach their full potential. After losing her best friend to a drug overdose in her mid 20s, Anthony co-founded the Justin Slade Youth Foundation and was the founding executive director of The Dugout Coffeehouse and Youth Centre in Fort McMurray. As a Christian, Anthony strives to show love and compassion to everyone she meets and make them feel like they matter. Married to her Harley-loving husband, Mike, of 17 years, they have two teenage children, Kaci and Brody. Together they serve with the Wood Buffalo chapter of Bikers for Christ. They currently reside in the heart of Canada’s Oilsands, Fort McMurray, Alberta.